Having joined Emerald Waterways for their maiden voyage back in May 2014 at the Dutch city, it seemed a fine idea to make another trip to the Low Country and visit places not explored on previous occasions. I’ve been going for over 50 years writes Malcolm Ginsberg. The people are friendly, for the most part can speak English and if you are desperate BBC South East is easily picked up on most TVs. Emerald is a scaled-down version of the highly successful Scenic Tours 5-star operation, offering much the same itineraries in European waters and now with a fleet of seven ships. Emerald prefers one does not even mention the other product, but passengers talk to each other and the coaches supplied for off-the-ship tours are often very much Scenic branded. The local guides look after Scenic as well and some of the senior ship crew are recruited via that route. What Scenic offers is fewer passengers on the same size boat, hence larger cabins (151 v 182), butlers and cabin service, three different dining opportunities and, to a slightly higher standard of catering, an all-day snack bar, courtesy alcoholic drinks anytime, more off-ship activities and entertainment, plus electric bikes for use at ports visited. On average, you will pay 20% more. Emerald scores with an on-board indoor swimming pool with a sliding roof which converts to a cinema and social area in the evening. It was to prove to be very popular. Showing on the big screen was Mamma Mia! Finally, the level of service is truly excellent with the vast majority of the 47 crew signed up from year to year, and all European. My review from 2015 hardly needs revising (See BTN 5 May 2014). This time, the ship is Emerald Sun. The steps into the swimming pool, which were too short, now allow an easy access into the warm water, and the free wi-fi works perfectly at a decent speed. On the eating front, the choices seem to be more varied. There was always a vegetarian offering and, with the buffet breakfast and lunch, a fine choice of dishes. For the evening dining, there was plenty of choice on the menu and everyday standard options included steak and salmon. On offer was complimentary beer and soft drinks with lunch and dinner, always with local wines from regional vineyards. No dressing up for the evening meal, although for the welcome and departure dinners guests are noticeably smarter. Smoking is prohibited on board except in a designated area on the open top deck. For an off-ship tour, Emerald offers what it calls a ‘quick pen’, a mobile hand-held communicator with a headphone jack. Listen to what your local guide has to say. We arrived early for our trip, staying the Wednesday night at the extremely comfortable 4-star Novotel Amsterdam City, ideal for the RAI exhibition centre and about 100m from the metro into the city. Very large rooms, truly excellent buffet breakfast and free wi-fi. Just by is the Amstel Park and within a short walk are some eating places. Next it was King’s Day, Thursday 27 April, an excuse, if ever the Dutch needed it, to party. It dates back to 1885 as Queen’s Day, and now celebrates the birthday of King Willem-Alexander. The centre of Amsterdam becomes more or less traffic free and public transport is much restricted. We joined Sun late that morning and were instantly made welcome, our room jumping the preparation queue for later arriving guests, offered a buffet lunch, and then on to the King’s Day festivities, with food stalls all over the place and a thriving flea market. It’s the annual way the Dutch dispose of unneeded clothes, bric-a-brac and electrical items that may have seen better days but still have some value. 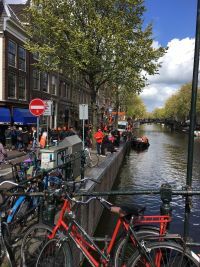 If the weather is kind, the whole of Amsterdam seems filled with people determined to have a good time, some dressed in fancy costume, everyone smiling. In orange! For the first night, it was a buffet dinner and a way of settling in, although even the most normally confused cruise ship traveller should have no trouble in finding their way around. Three accommodation decks, a single corridor down the middle of the ship at each level, with the restaurant beneath the lounge. All very easy. A small gym and spa tucked away. An 08:30 start the next morning and it is off by coach to Zaanse Schans with the guide introducing the Netherlands. The village is a collection of well-preserved historic windmills and houses which were collected between 1961 and 1974 from all over Holland. The Zaanse Schans is one of the popular tourist attractions of the Netherlands and an anchor point of the European Route of Industrial Heritage (ERIH). 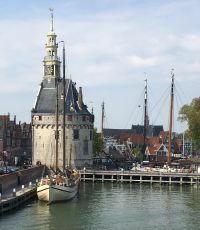 It hosts seven museums: the Weavers House, the Cooperage, the Jisper House (fisherman’s cottage), Zaan Time Museum, Albert Heijn Museumshop, Bakery Museum and also the Zaans Museum. Perhaps the most interesting event was a demonstration of clog making. A cobbler told us that he wears thick socks to make clogs more comfortable. Nina, our young Dutch cruise director and perpetual extra guide, said she could not wear them. The Zaans Museum houses cultural-historical and regional collections and a work by the French impressionist painter Claude Monet, entitled The Voorzaan and the Westerhem. Next day it was one of the highlights of the whole trip, the Delta Works flood prevention project. However, first call was the delightful little port village of Veere, once a major commercial centre with connections to 15th century Scotland which it still treasures. The Saltire is proudly flown. Dominating the whole place is the Grote Kert, a vast place of worship, far too grand for what is now a very sleepy little hamlet. There are nice tea shops and plenty of places to buy cheese. The Delta works is one of Europe’s great engineering projects of the second half of the 20th century. Its importance is with the Dutch to this day. It protects much of the country from the sea and includes Flevoland, reclaimed land that is now a province of the Netherlands. Essentially, it lies between Rotterdam and Antwerp. The area known as Holland has always been vulnerable to the North Sea, flooding a way of life. However on 31 January 1953, matters got completely out of control with nearly 2,000 lives lost in a single night with an unprecedented storm. The Dutch knew they had to do something to stop it happening again. The result is the world’s largest storm surge barrier declared one of the Seven Wonders of the Modern World by the American Society of Civil Engineers. “Neeltje Jans” is in effect a theme park, a day out for investigative adults coupled with a children’s area full of educational attractions. But firstly there is the Delta Experience, an impressive panoramic 3D animation that allows visitors to experience the devastating power of water. No film was taken in 1953. Then on to the sea wall and sluice gate operation with visitors able to tour virtually underground beneath the massive concrete structure. On a quiet sunny day, it is difficult to imagine how powerful the unrestrained sea can be. It was a night-time run into Antwerp, Europe’s second largest port (after Rotterdam), but mooring right in the city centre you get the feeling that you are in a provincial town rather than the second largest Flemish-speaking metropolis in Belgium. Our berth was just a couple of hundred yards from the historic riverside Steen Castle. It is now a free visitors’ centre for children. Medium-size sea-going cruise ships can also get up this former commercial dock area. In its centre, the centuries-old Diamond District houses thousands of diamond traders, cutters and polishers. Antwerp’s Flemish Renaissance architecture is typified by the Grote Markt, a central square in the old town. At the 17th-century Rubens House, period rooms display works by the Flemish Baroque painter Peter Paul Rubens. It is a very easy flat walk from the ship, an alternative being an open top hop-on hop-off bus tour, which also takes you past the Antwerp zoo, one of the largest in Europe. Before visiting the Airborne Museum ‘Hartenstein’ in Oosterbeek, we watched the Richard Attenborough epic A Bridge too Far to try to gain some perspective of the disaster which cost nearly 2,000 British and Polish military personnel their lives and also dented the reputation of several generals including Montgomery. In September 1944, in an attempt to shortcut the road to Berlin, airborne troops attempted to form a bridgehead on the northern banks of the River Rhine at Arnhem. 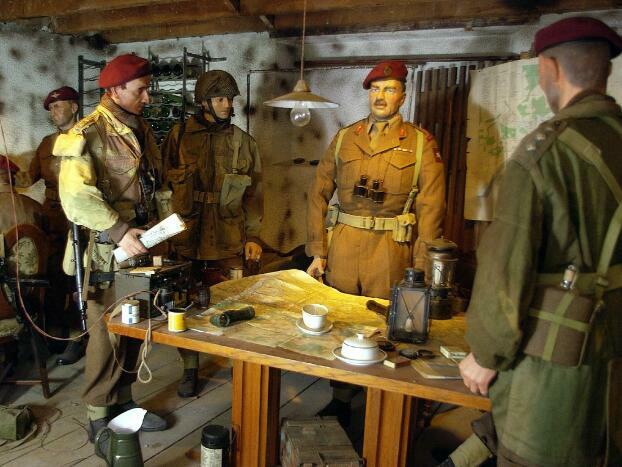 Hartenstein served as the headquarters of the British 1st Airborne Division. In the museum, an extensive and diverse collection is displayed consisting of original weaponry, genuine uniforms and equipment used in the battle. The numerous photos and films on display provide a realistic picture which is enhanced by interviews with Allied soldiers. We also visited the Commonwealth War Graves cemetery, as ever immaculacy kept and a place for quiet contemplation. Hoorn was a morning call, another one-time Dutch trading port and now said to be one of the largest private boat marinas in Europe. It was from here that some of the great 16th century explorers left on epic voyages to the East and how the southern-most tip of America got its name. But you cannot compare this sleepy commuter town to the stormy cape. Just by the docking point is the unique Museum of the 20th Century housed in a former jail, ‘De Krententuin’. For the Emerald clients, mostly dating from the 1940s and 1950s, it was a nostalgic visit. Just a 20min walk through the historic and pretty town is the railway station and a chance to ride on a steam train the 12 miles to Medemblick through an area serving as a developing test bedding area for many varieties of bulbs and flowers. For the afternoon, it was Volendum, a delightful little town and still a fishing village, now much given over to tourism but still with the canals and preserved old houses from earlier centuries. It sits on the Markermeer Lake, a very large freshwater lake but once part of the Zuider Zee, the area now protected by flood barriers. Nearby is Edam, home of cheese. Somehow we found time for a visit. Mind boggling, the Keukenhof Gardens is open only for a short period each year with the dates already settled for 2018 (22 March–13 May) and 1.5m visitors expected. The best time to view the tulips is around mid-April, depending on the weather. According to the official website, some 7m flower bulbs are planted annually in the park, which covers an area of 79 acres. It was about a 30min run from the ship with parking well organised and straight in bypassing the queue. Each year, 40 gardeners plant bulbs at reserved locations throughout the park. At the end of the season, these bulbs are harvested, and a new cycle of planting, blooming and harvesting begins again in the autumn. 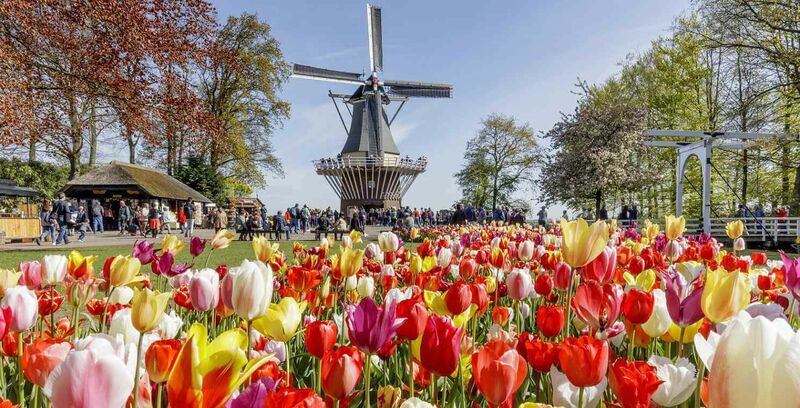 The public access windmill at Keukenhof is more than a century old. It was built in Groningen in 1892, and was used to pump water out of the enclosed dyke area. Within the park there are a number of pavilions typified by the 1,000sq m Beatrix, specifically for orchids. This display is one of the most beautiful spectacles of its kind in Europe. Another traditional leading attraction is the lily display in the Willem-Alexander Pavilion. In its 6,000sq m, visitors can admire some 15,000 lilies in more than 300 different varieties. The Oranje Nassau Pavilion showcases the use of flower bulbs in interiors. It demonstrates how flower bulbs can be applied in different styles of interior design, from classic to modern. For 2018, Emerald will once again be running a short programme of what it calls “The Netherlands and the Beauty of Belgium tours”. 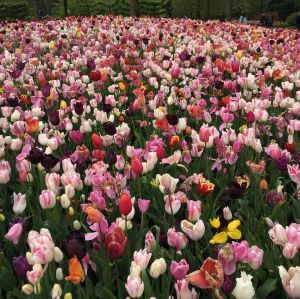 The Keukenhof visit is a great finale to a wonderful eight days.